I have a file called Blog Posts Yet to Post where I store drafts of ideas and eventually find some worth revising and using. Today, in search of this week’s post, I found three rough drafts about moving, and I since I’m getting to the end of that topic, I didn’t need three posts. One was about sorting through my books and deciding which to keep and why, one was about parting with some of my art, and one was about no longer working as a professor. I’m so happy about the latter, there’s not much else to say. I went into my office this afternoon just to use a desk with a proper chair (I’ve sold almost all of my furniture) and that felt good, but I won’t miss sitting there for hours reading student papers. Or emails. I will stay in touch with some special people I got to know through the job, but it’s easy to let go of the work itself. A friend who is going to open a used bookstore bought about eighty books. Those were easy to let go of, too. Parting with a piece of art is harder, sort of like cutting scenes when revising a book, but I decided not to challenge certain fragile things to make a trip to New Mexico. The Santa Clara Pueblo buffalo dancer, a small statuette made of black pottery, broke a hand, a foot, and a leg on his way to North Carolina from Santa Fe many years ago. I repaired him as well as I could. The powerful energy I felt at a buffalo dance was unforgettable, a force that swept through my whole body to the bones. He holds that sacred feeling in his glued-together form. I was happy when a neighbor who teaches history in the public schools and loves Native American history wanted him and several other items. 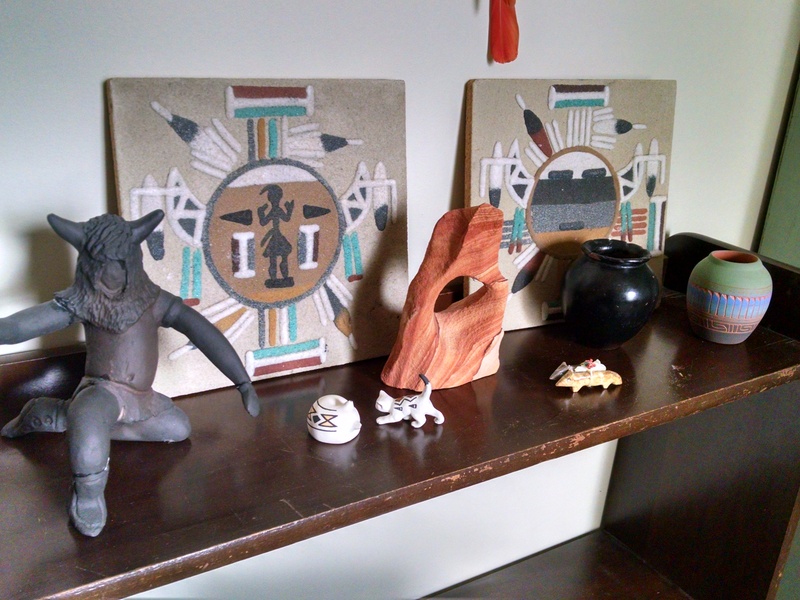 When she came to get them, she asked which piece was made by which tribe, and appreciated the buffalo dancer for what he means, cracks and all, not for collectible value. I packed him carefully, wrapped the tiny Acoma cats so they wouldn’t break, and sent the collection off with someone who will feel the spirit of New Mexico in it. Friends value us that way—for our spirits, flaws and all, not expecting or needing perfection. Letting go of people is harder. My closest friends in Virginia (and North Carolina and Georgia) will come out to see me eventually, but I won’t see them as often anymore. One who has helped me with the multitudinous hassles of the moving-out process has grown even closer as we’ve worked on things like my moving sale, and I will miss her all the more. I’ve said most of my goodbyes on campus, but I still have two more yoga classes to teach, to students who have been with me for years. I have friends to rejoin in T or C, and I’ll find new yoga students there, but it will still be hard to say the last “namaste” in Virginia. Moving and retiring is a positive disruption and it’s one that I chose. Still, I’m prone to wishing I could just get the tedious parts over with. There is no “over with.” It’s all part of my life, unique moments I am consciously living. I’m more effective when I’m present to a process, whether it’s cleaning out my desk, selling off my furniture, or going to one last department meeting. Not only more effective, but happier. Slowing down, I can get more out of each step of this change and put more into it. Be more attuned to the people around me. An attitude of rushing doesn’t speed things up. An attitude of spaciousness eases the pressure. It will all get done. It’s like yoga. 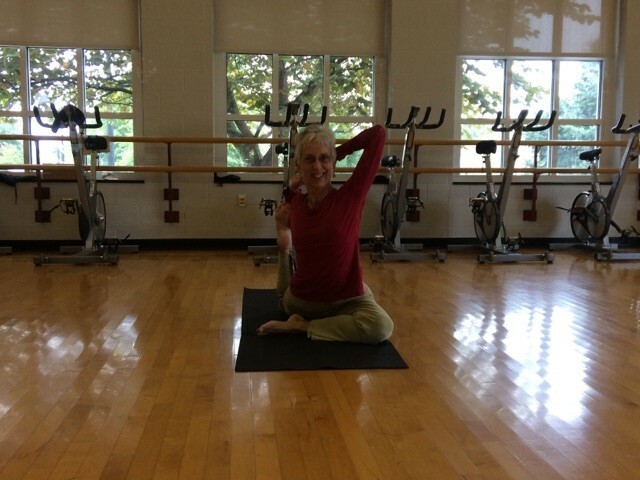 Set up the pose with attention, be aware of the pose, sustain the pose, exit mindfully. Note: the pictures were taken in the exercise studio on campus where I did my most important work: teaching yoga. At my retirement party, that’s what everyone was talking about. Yoga. Fellow paranormal mystery author Terri Herman-Ponce did an interview with my protagonist on her web site. I love this idea–interviewing the character rather than the author. Get to know Mae better, in her own words. We’re on a character interview roll! Over the weekend, I chatted with Mae Martin. She’s a southerner who loves silliness, hates bullying, and has a very unusual talent for solving mysteries. She’s also the product of Amber Foxx’s imagination, author of The Mae Martin Mysteries. Mae is an extraordinary character with a very extraordinary way of seeing the world — one that’s very different from us. Intrigued? Read on for more about Mae Martin and some fascinating mystery reading! a trellis for her jasmine. 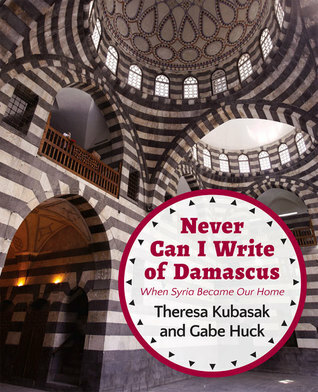 Never Can I Write of Damascus: When Syria Became our Home, by Theresa Kubasak and Gabe Huck is a memoir of the couple’s years with the Iraqi Student Project, preparing Iraqi refugees in Syria in to attend college in the U.S. Huck and Kubasak chose the work of creating educational opportunities for Iraqi young adults as their way of compensating in some small way for the damage done to Iraq by the U.S. invasion. They chose Syria because it had welcomed such large numbers of Iraqi refugees. Little did they know that in seven years they would be leaving Syria themselves, and that this country they came to love would be flooding the world with its own desperate refugees. If I were not about to retire from education, I might use this book in a first-year seminar, teaching college students how to explore intellectually, do critical thinking, engage in civil discourse, and appreciate learning, language and culture for their own sake. The model of highly motivated learning in the ISP groups is fascinating, as they discovered world literature and poetry in discussion groups and worked together in writing workshops, to a large extent self-directed with guidance from Kubasak. Through this book, I’ve learned more about Syria than I have ever learned from the news. I got a clear feeling for what it must be like to leave your home and your possessions because your life is in danger and your country at war within itself, and also for how Syria made room for refugees, first from Iraq and then from its own disrupted society. Though they make occasional references to politics, most of all Huck and Kubasak have written a love letter to Damascus: its language, its architecture, its food, its artisans, its spirituality, and its people. Damascus as it was. The city in this memoir is full of music, dancing, fresh fruit juices, family, prayers, creativity, and most of all friendliness and generosity. The authors use excerpts from student writings, interviews with local residents, and quotations from books and poetry to illustrate the themes of each chapter. One moving story is from an Iraqi refugee. She tells about stopping in Mosul on a cold night as one of many escaping to Syria, taking shelter in a mosque. The travelers didn’t know each other, but little by little they drew closer to each other for conversation and for warmth, and thus they spent the night, comforted by each other’s human presence and warmth. They were Shia, Sunni and Christian in that group, and it no longer mattered at all. My final meeting with my Virginia book club was special. It’s the only time we’ve had the author of the book we read join us. 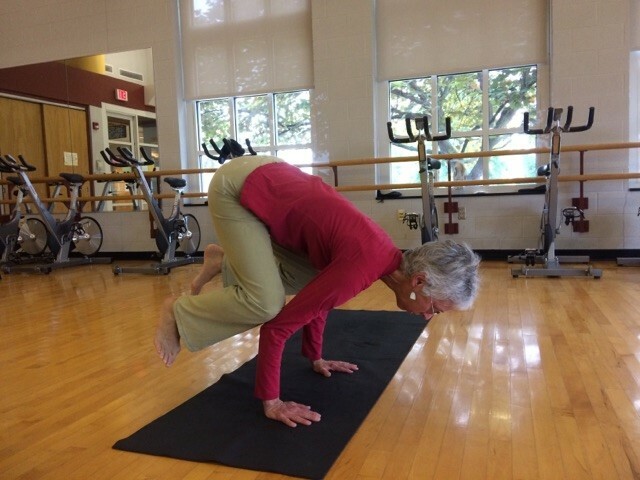 Two of us in the club know Theresa Kubasak as our yoga student, and we invited her to talk with us and share the in-depth stories behind her memoir. As our guest, she did something quintessentially Syrian. Eager to share Syrian culture with us, she brought food: fresh hummus seasoned with garlic and sumac, freekah (cracked wheat with slivered almonds), figs and dates stuffed with walnuts, and the wonderful soft flatbread that she describes in her book as something people often carry home on their heads. The generosity and sociability of the Syrian people is the life force that animates the book. She embodied that spirit. In addition to cooking for us, she brought two of the books of the poems and essays written by the Iraqi refugee students she and her husband worked with, and a long white curtain inscribed by a number of the students with the best lines from their essays about spiritual life. For a while, it hung over a door in my apartment, words written by young people in Damascus. There was something moving about its presence, a scene from their lives carried into ours, bearing their words in their handwriting. One of the writers, Mustafa, had signed his name over a sketched bank of fluffy clouds. A book club member who volunteers helping Syrians resettle here was so entranced by the small volume of the student writings that she read some of the poems over and over and then had to share them aloud with us. Not all book clubs will be so fortunate as to be able to invite the author, but if you’re in a club and need something important, moving and different to read, I recommend this. Have some Syrian food as you discuss it, and apricot or pomegranate juice and tea.